We, "Monaco Creative Motors" has set ourselves the task to introduce in the european market a unique and inimitable car - Mitsuoka Himiko Roadster - full of style and excellence which has incorporated all the best in the design and traditions of the past century, an embodiment of elegance and refinement of aristocratic design but at the same time an absolutely modern car meeting the requirements of our time and combining modern options for comfortable use. HIMIKO incarnates the spirit of the bygone era in a modern materialization, demonstrating all the dynamics of “the century of change” and present-day technologies of car manufacturing. The classical shell holds units and elements corresponding to the present time; the body has been designed in accordance with modern safety standards; the well thought out ergonomics create a feeling of complete convenience for the driver and the passenger. HIMIKO classic-style cars have all the necessary equipment for comfortable driving: an automatic shift gearbox, power steering and brake booster, air conditioning system, xenon lighting, Acoustic Vehicle Alerting System (AVAS) as well as Keyless-Go. Mitsuoka did not intend to just keep up with fashion and to design another stylish but inconvenient car, produced to just stay on an exhibition stand or in a garage only. On the other hand, Mitsuoka was not going to forget about beauty in the sole pursuit of functionality. The developers faced an ambitious task: to develop a cabrio-roadster combining the elegance of the retro style and modern technologies, and they have met the challenge brilliantly. The classical Himiko Roadster is a genuine find for those who have a love for British-style cars: a car which embodies a unique design, style and the best traditions of automobile manufacturing of the bygone era. It looks really luxurious and modern. See for yourself ! Besides, the car is absolutely modern in terms of its technical characteristics. A simple example: have you seen many rare cars with an automatic gearbox which enables women to drive freely and comfortably? And generally have you often seen a woman driving an old-timer? The answer is no and the reason is quite simple: ordinary vintage cars are extremely inconvenient to drive; they often lack even power steering and brake booster. The idea of Himiko Roadster is based on comfortable everyday driving ! It is noteworthy that while developing Himiko Mitsuoka set itselves the task to create a car which would not be exorbitantly expensive for a hand-built car despite all its extravagant beauty. Introduction of another exclusive weekend car to the public was beyond the scope of Mitsuoka's goals: we wanted to make a car meant for comfortable everyday driving, reliable, simple, convenient and cheap maintenance. Just what a car for everyday use is supposed to be ! Could you ever imagine a collectors’ car which you could drive every day? This is the exact task, Mitsuoka wished to accomplish with our project. It is an open secret that the task was solved using the best practices of Mazda concern. This magnificent car was carefully created with attention to detail at the plant of Toyama in Japan on the basis of Mazda MX5 with complete conversion and extension of the body, increase of the wheelbase and alteration of the interior by the hands of skilled craftsmen. The Head office of our company - "Monaco Creative Motors" SARL is in Monaco. We were inspired by the picturesque Mediterranean landscapes of the Cote d'-Azur, Saint-Tropez and Monaco… Those of you who have been there will understand us! It is enough just to see those perfect landscapes once to understand how naturally and harmoniously Himiko fits into the beautiful scenery and atmosphere of the French Riviera. Today Monaco has become a synonym of the “luxury” lifestyle; however, the local public cannot stand “mauvais gout” and accepts refined taste only. The principality is fascinating with its views quickening one’s imagination, its blossoming gardens, fascinating environment of the French Riviera, amazing architecture and refined luxury. Apart from that, Monaco is known for its historic Grand Prix Rally where the participants both exhibit their stunning rare cars and participate in the race down the winding city streets. Now you understand why it is Monaco that we have chosen for our headquarters. Our company "Monaco Creative Motors" is a single brand project; at the moment we are promoting one car model only - ROADSTER HIMIKO. After visiting and observing the hand-made production of Himiko at the Mitsuoka factory we were very impressed with the uniqueness, design and quality of Himiko and considering the market of Europe, while having the knowledge of european taste, we planned to obtain the Dealership of Mitsuoka Himiko. 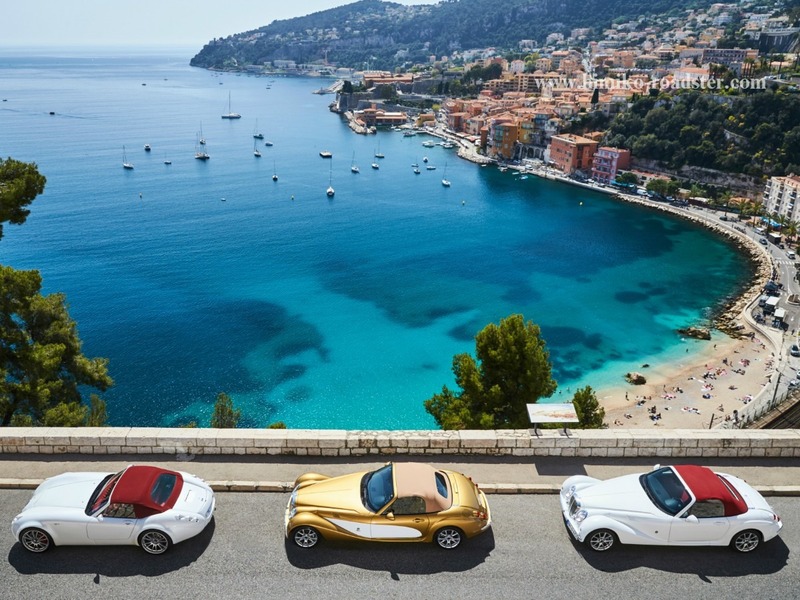 That was the base for bringing Himiko to Monaco and Cote d'Azur, where "Monaco Creative Motors" with its experienced team is involved in selling and promoting various european and non-european cars. We strive to contribute to society by creating and selling cars that provide people the joy of realizing their dreams. "We would like to convey the joy of driving an original car to the people of the world" – this wish was the starting point and is a driving force of our company. With the professional promotion and publicity, specially by driving Himiko on the popular localities of Cote d'Azur, our company has now been a well-known dealer of Himiko Roadster in Monaco, France and other surrounding european countries. Cars that Mitsuoka delivers to customers are most characterized by their elegant designs that you cannot find in mass production cars. Every step at the production-line of Mitsuoka is accomplished by the "Hands" of craftsmen who devote themselves to build each and every car. A car manufactured in this way has a scarcity value and it is really created uniquely for you. If you favour a particutar colour in the line-up & are in harmony with Roadster Himiko concerning its philosophy we will be happy, as a team of Mitsuoka, to whole heartedly arrange for you an exceptional & unique car. We hope that you will duly appreciate this project and will share our passion and our tastes !